To Cite: Jabalameli M, Shariatzadeh H, Babaei R. Large Isolated Anterior Osteochondral Fracture of the Medial Femoral Condyle: A Case Report, Shafa Ortho J. 2018 ; 5(2):e67456. doi: 10.5812/soj.67456. Introduction: Coronal plane Fractures of the femoral condyle are known as Hoffa fractures. Although isolated posterior Hoffa fractures of medial femoral condyle have been rarely reported, no reports are available regarding the anterior fracture of this type. Here, we report a large isolated anterior osteoarticular fracture of the medial femoral condyle. Case Presentation: A 16 - year - old girl with a traumatic open joint injury of the right knee caused by a car - to - pedestrian accident was referred to our emergency department for further evaluation. A physical examination of the knee revealed effusion and limited knee range of motion. While no obvious fracture was detectable on plain radiographs of the knee, a large anterior osteoarticular fracture of the medial femoral condyle was observed in computed tomography (CT), which was detached from the medial condyle. The fracture was managed with open reduction and internal fixation. Eight weeks after the surgery, the patient retrieved the full knee motions and the complete union of the fracture was observed. No complication was reported by the patient at a follow-up period of 12 months. 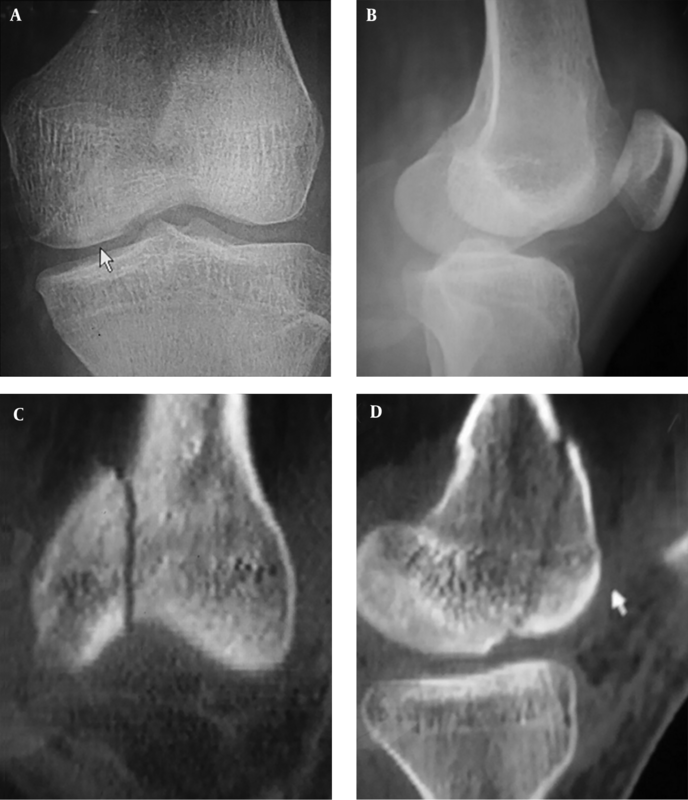 Conclusions: In cases with knee tenderness and/or effusion and normal plain radiographs, whenever there is a discrepancy between plain radiographs and clinical symptoms of the patient, a further evaluation of the knee with a CT scan and/or MRI is necessary to avoid missing a Hoffa fracture, which could be successfully treated if timely diagnosed. Fractures of the femoral condyle in the coronal plane are commonly addressed as Hoffa fractures (1). Based on AO/OTA classification, these fractures are further categorized into three subtypes including anterior and lateral flake fractures (B3.1), unicondylar posterior (B3.2), and bicondylar posterior (B3.3) (2). Although isolated types of B3.2 and B3.3 are extremely rare and not extensively studied, few reports of these fractures are available in the orthopedic literature (3-6). However, to the best of our knowledge, no report is available regarding the isolated anterior osteoarticular fracture of the medial femoral condyle (type B3.1). These fractures are intra - articular and demand timely anatomic reduction and internal fixation at the earliest opportunity. Reports of such injuries are highly valuable to understand the mechanism of injury, optimize the surgical approach, and improve the outcome of the treatment (7). Here we report a case of large isolated anterior osteoarticular fracture of the medial femoral condyle for the first time in the literature and describe our therapeutic approach and the patient’s outcome. A 16 - year - old girl with a traumatic open joint injury of the right knee caused by a car - to - pedestrian accident, which was suspicious of fracture based on the plain radiographs, was admitted to our emergency department for further evaluation. Clinical examinations of the patient revealed a painful swollen right knee with a lacerated wound of nearly 6 cm located longitudinally at the anteromedial aspect of the knee joint, accessing the joint by tearing of medial retinaculum, capsule, and synovium. The range of knee movements was restricted. No sign of neurovascular deficit or increased compartment pressure was present. Considering the results of clinical examinations and inadequacy of plain radiographs for the definitive evaluation of injury, we decided to assess the injury further using computed tomography (CT) scanning. In the CT scan, a large anterior osteoarticular fracture was observed in the medial femoral condyle of the patient’s knee (Figure 1). Figure 1. 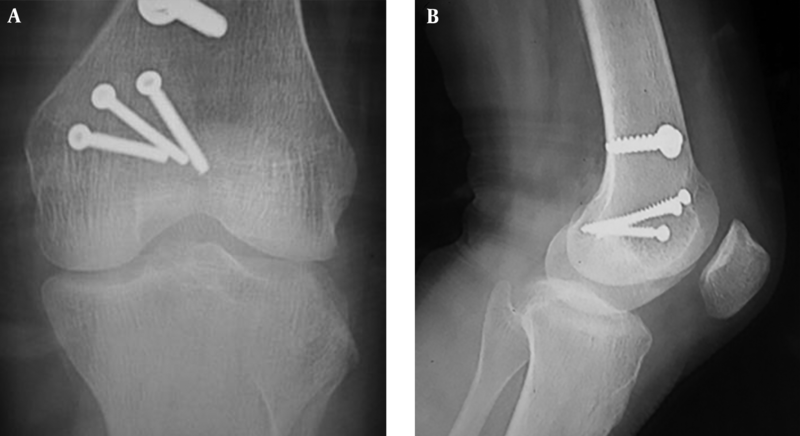 Pre - operative anteroposterior (A) and lateral (B) radiographs and CT (C and D) scan of isolated anterior Hoffa fracture of the medial femoral condyle. The fracture was not detectable in plain radiographs. The double shadow sign in figure A (arrowhead) is due to the superimposed displaced fracture of the medial femoral condyle. A medial knee arthrotomy was planned for the patient. In this respect, under tourniquet and regional anesthesia and in the supine position, the stability of the knee was examined physically. After assuring that the knee is stable, the wound was meticulously debrided and extended proximally. Then, the prepatellar fat pad was incised longitudinally to expose the fracture site. Thereafter, the fracture pattern was intra-operatively assessed, revealing a large anterior osteoarticular fracture of 4 × 1.5 × 8 cm, completely detached from the anterior aspect of the medial condyle of the distal femur. The extensor mechanism, except its internal retinaculum, was intact. The fractured segment was superiorly migrated from its bed and considered as completely unstable. Therefore, it was reduced and fixed securely with one buttress screw (4.5 mm cortical screw with metal washer) and three lag screws (4 mm cancellous screws). All screws were inserted in the metaphyseal area and out of the articular surface (Figure 2). We did not notice any other associated lesion in the direct evaluation of the whole knee. The physical examination confirmed the knee stability after the operation. Then, the prepatellar fat pad, synovium, medial retinaculum, subcutaneous tissue, and skin were sutured separately and the capsule was left open. The whole irrigation was carried out with 9 L of normal saline. After dressing the wound, a long leg splint was applied for 6 weeks, with the knee positioned at 15° of flexion. The knee range of movements started after the surgery. Touchdown weight - bearing using two crutches started after the operation as much as tolerated. Keflin (1 gm q6h IV) continued for 48 hours from admission. Full weight - bearing was allowed 6 weeks after the operation. The first visit of the patient was two weeks after the operation. The later visits were performed monthly for the first three months and every three months afterward. In each visit, knee ROM, effusion, pain, and tenderness were checked and recorded and appropriate rehabilitation programs were ordered. Follow - up radiographs of week 8 showed complete union without any displacement of the fracture. Moreover, the full range of knee motions without any pain or difficulty was observed in the physical examination. At the last visit (12 months after the surgery), no sign of avascular necrosis was seen in the fractured segment of the knee. Moreover, no sign of degenerative joint disease was present in the knee radiographs. The isolated Hoffa fracture is an infrequent injury of the femoral condyle and few reports are available. Lateral condyle involvement is more frequent (7). Gavaskar et al. prospectively reviewed the outcome of 18 isolated Hoffa fractures, from which seven fractures involved the medial condyle (8). Singh et al. described the functional outcome of 8 isolated Hoffa fractures, from which 5 lateral and 3 medial Hoffa fragments were detected (9). Dhillon et al. also presented a series of 6 cases of Hoffa fracture of the medial femoral condyle with an intact ipsilateral lateral femoral condyle (4). The majority of the reported isolated Hoffa fractures of medial femoral condyle emerge at the posterior aspect of the condyle and to the best of our knowledge, no case of isolated Hoffa fracture of the anterior aspect of the medial condyle has been reported so far. Mabry et al. reported an impaction fracture of the anterior aspect of the medial femoral condyle, which accompanied partial tear of the left anterior cruciate ligament and was managed conservatively (10). Here, we reported a case of isolated Hoffa fracture of the anterior aspect of medial condyle that was successfully managed with open reduction and internal fixation surgery. Hoffa fractures are difficult to diagnose on plain radiographs and they are easily overlooked. The diagnosis often requires strong clinical suspicion, with respect to the mechanism of injury and physical examination (7). Thus, reports of such rare entities are of considerable value to further explore the characteristics of this injury and optimize its treatment. In our case, we detected the Hoffa fracture accidentally on CT scan, while we were suspicious of other fractures on the plain radiographs. The CT scan is an invaluable imaging modality to detect such fractures and is recommended in all knee injuries suspected of occult fractures. In patients with normal plain radiographs and knee joint effusion or subtle instability in coronal or frontal knee axis, CT scan should be performed for further study of the injury (11). Moreover, magnetic resonance imaging (MRI) can reveal a hypointense fracture line of coronal orientation with adjacent bone marrow edema on fluid - sensitive sequences (7). The aim of the treatment is to reach anatomical reduction and rigid fixation, which is obtained with the surgical approach (11). Since these fractures are susceptible to displacement on flexion of the knee and axial loading, non - operative management usually associates with poor outcomes, even in non - displaced fractures (12). However, favorable results of conservative treatment have been reported in the management of non - displaced Hoffa fracture (13). We managed the injury by open reduction and internal fixation with screws as buttress and lag modes in the metaphyseal area of the fracture segment, which proved to be successful at a follow - up period of 12 months. With this approach, we were able to start the rehabilitation process right after the operation that achieved full knee movements with no complications until the latest follow - up session. In conclusion, we recommend complete physical and radiographic examination of the knee (AP, lateral and oblique views) and nearby structures in patients with knee trauma, especially in the presence of tenderness and/or knee effusion with normal plain radiographs and whenever there is a discrepancy between plain radiographs and clinical symptoms of the patient. In such cases, further evaluation of the knee with a CT scan and/or MRI is necessary to avoid missing a Hoffa fracture, which could be successfully treated if timely diagnosed. 1. Hoffa A. Lehrbuch der Frakturen und Luxationen fur Arzte und Studierende. Enke; 1904. 2. Muller ME, Nazarian S, Koch P. Classification AO des fractures. springer; 1987. 3. Ruchelsman DE, Tejwani NC, Kwon YW, Egol KA. Coronal plane partial articular fractures of the distal humerus: current concepts in management. J Am Acad Orthop Surg. 2008;16(12):716-28. [PubMed: 19056920]. 4. Dhillon MS, Mootha AK, Bali K, Prabhakar S, Dhatt SS, Kumar V. Coronal fractures of the medial femoral condyle: a series of 6 cases and review of literature. Musculoskelet Surg. 2012;96(1):49-54. doi: 10.1007/s12306-011-0165-0. [PubMed: 21904943]. 5. Manfredini M, Gildone A, Ferrante R, Bernasconi S, Massari L. Unicondylar femoral fractures: therapeutic strategy and long-term results. A review of 23 patients. Acta Orthop Belg. 2001;67(2):132-8. [PubMed: 11383291]. 6. Ul Haq R, Modi P, Dhammi I, Jain AK, Mishra P. Conjoint bicondylar Hoffa fracture in an adult. Indian J Orthop. 2013;47(3):302-6. doi: 10.4103/0019-5413.111509. [PubMed: 23798763]. 7. White EA, Matcuk GR, Schein A, Skalski M, Marecek GS, Forrester DM, et al. Coronal plane fracture of the femoral condyles: anatomy, injury patterns, and approach to management of the Hoffa fragment. Skeletal Radiol. 2015;44(1):37-43. doi: 10.1007/s00256-014-2015-2. [PubMed: 25273616]. 8. Gavaskar AS, Tummala NC, Krishnamurthy M. Operative management of Hoffa fractures--a prospective review of 18 patients. Injury. 2011;42(12):1495-8. doi: 10.1016/j.injury.2011.09.005. [PubMed: 21993368]. 9. Singh R, Singh RB, Mahendra M. Functional Outcome of Isolated Hoffa Fractures Treated with Cannulated Cancellous Screw. Malays Orthop J. 2017;11(2):20-4. doi: 10.5704/MOJ.1707.016. [PubMed: 29021874]. 10. Mabry LM, Ross MD, Abbott JL. Impaction fracture of the medial femoral condyle. J Orthop Sports Phys Ther. 2013;43(7):512. doi: 10.2519/jospt.2013.0413. [PubMed: 23812292]. 11. Arastu MH, Kokke MC, Duffy PJ, Korley RE, Buckley RE. Coronal plane partial articular fractures of the distal femoral condyle: current concepts in management. Bone Joint J. 2013;95-B(9):1165-71. doi: 10.1302/0301-620X.95B9.30656. [PubMed: 23997126]. 12. Lewis SL, Pozo JL, Muirhead-Allwood WF. Coronal fractures of the lateral femoral condyle. J Bone Joint Surg Br. 1989;71(1):118-20. [PubMed: 2914979]. 13. Mak W, Hunter J, Escobedo E. Hoffa Fracture of the Femoral Condyle. Radiol Case Rep. 2008;3(4):231. doi: 10.2484/rcr.v3i4.231. [PubMed: 27303561].